The Yale Assure Lock SL is the lock of the future. Updated November 9 to include additional information on the app in the What’s App section. 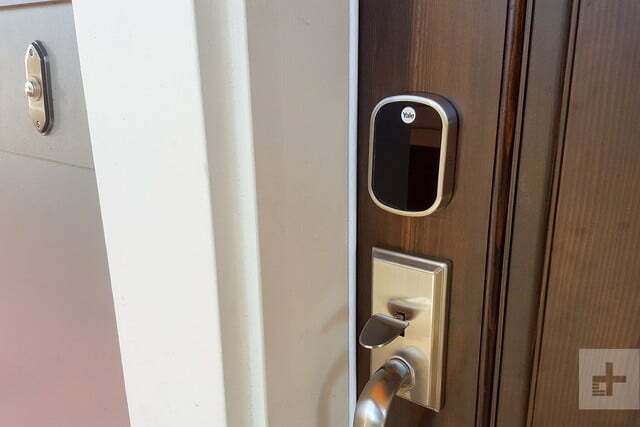 No matter how smart it is, most people won’t be excited about a new door lock. Locks are functional, utilitarian, and often bulky. If they’re doing their job — which they do 99 percent of the time –they keep the bad people outside, your family safe inside, and that’s about it. 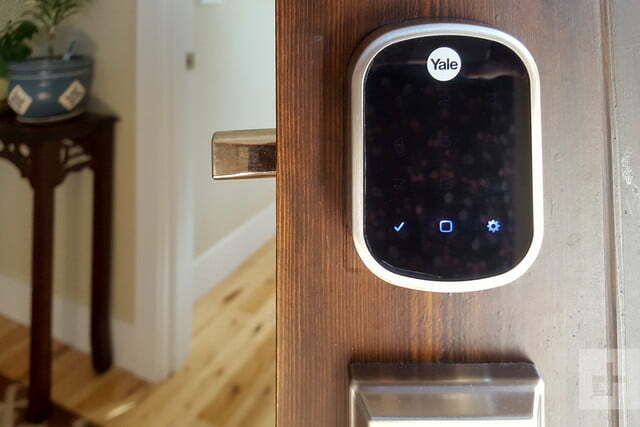 The Yale Assure SL smart lock is different. 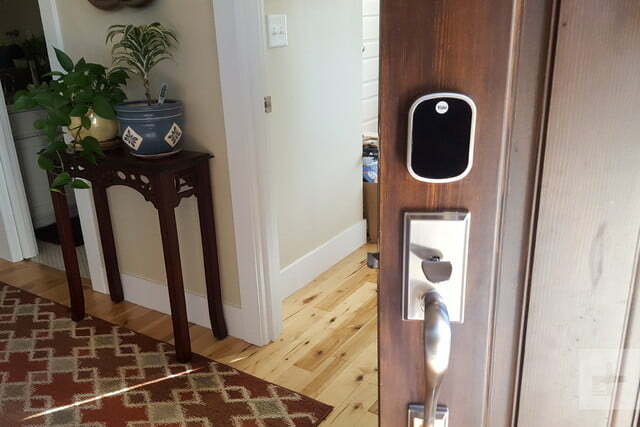 With its sleek, smooth onyx face and small footprint, this lock is a stylish device that you’ll admire every time you walk through your front door. 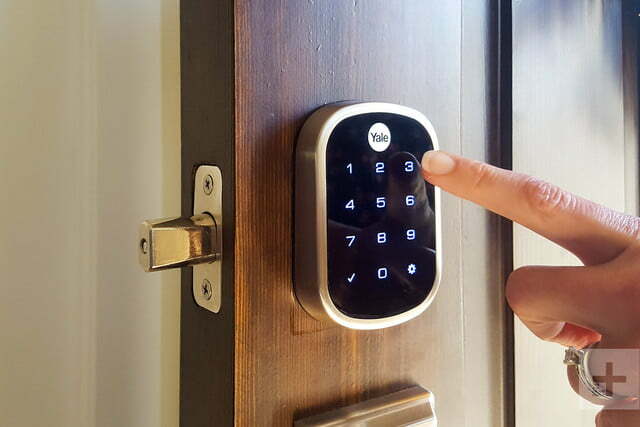 We spent some time testing it, and the beauty and functionality of the hardware impressed us every time we used the keypad to enter our house. Our Yale Assure Lock SL review below will show why this lock is worth excitement. The Assure SL (a bit steep at $200, or $250 with the Network module included) looks and feels small when you take it out of the box, especially compared to other locks on the market. In fact, it’s slimmer than most August Smart Locks. The front part of the lock – the side that guests see on your front door – measures 3.5 inches long, 2.5 inches wide, and just a half an inch deep. Most locks and are typically an inch or more longer, deeper, or wider. It’s a clean, attractive piece of hardware, with a shiny black touchscreen and a rounded rectangular shape. It’s also entirely keyless, a bonus if you hate having to carry around keys. Set up is easy if you already have a deadbolt on your door, and a standard face bore hole of 2 ⅛ inches. It fits doors between 1 ⅜ inches to 2 ¼ inches thick. 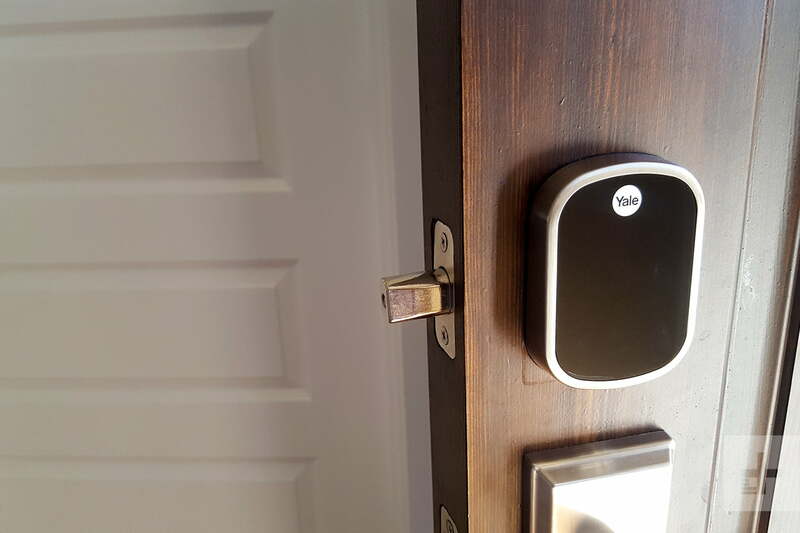 All we needed to install was a screwdriver to swap our old Yale Touchscreen Deadbolt with the Assure SL and an extra set of hands to connect the cable and screw the front and back together. We got the lock up and running in 20 minutes. We were impressed with how the lock looked once installed. The difference between the Assure SL and our old lock was like upgrading to a Google Pixel 2 from the old Motorola brick phone that Michael Douglas used in the movie Wall Street in the 1980s. This is the most futuristic door lock we’ve ever seen – much cleaner looking than even the attractive, newly-released Kwikset Obsidian electronic lock. This is the best-looking, most futuristic door lock we’ve ever seen. Yet while the front of the lock looks slim and futuristic, the back looks thick. Yale successfully took the bulk out of the front of the device, but had to put all the necessary hardware somewhere. Where it ended up is on the back, which features a manual latch for the deadlock, a compartment for four AA batteries, and a place for the Yale Network Module, which is needed if you want your lock to connect to your smart home — more on that later. Around back, the lock measures more than six inches long and 1.5 inches thick. It’s ugly, but at least it’s not on the front door, right? Our review unit came in satin nickel, which matched our brushed silver door handle perfectly. You can also buy the lock in polished brass or oil-rubbed bronze. There’s a numeric keypad that illuminates when you press the bottom left corner. We liked that the keypad was easily visible even in bright sunlight. When no one is punching numbers on the keypad, the numbers disappear. It’s just a gleaming, shiny onyx façade. The Yale Assure SL is as functional as it is beautiful. It can store up to 25 unique four- to eight-digit pin codes, and up to 250 if you connect to a hub. We mostly used three codes – one for us, one for guests, and one for cleaners. Our visiting relatives felt important when we gave them a personalized code. You can create or delete codes directly on the keypad using the instructions provided in the manual using the setting button. To illuminate the keypad and unlock the door, touch the check button on the bottom left side of the black screen. The numeric keypad illuminates, and the device makes a chiming noise to indicate it’s ready to go. Type in the code, hit the check button again, and the mechanical deadbolt slides open. If you get the code wrong, the device will admonish you with a DA-da-DA-da beep. If you take too much time to type in the code, a female voice will tell you “time expired,” and you’ll have to start the process over. The keypad responds to touch immediately, and the lock opens the instant the key is entered. To lock the door from the outside, simply touch the check button again and walk away. From the inside, just turn the bolt latch. Our review unit came with a Z Wave Network Module for an additional $50 — you can also get a Zigbee or HomeKit module for the same price — which allowed us to connect our lock to our Wink smart home hub. This means we could lock or unlock the door via our Wink app no matter where we were. We’re also connected to Amazon Alexa in our test house, so we could ask Alexa to lock our door for us. Either way, the connection between the devices was seamless and painless. With the Network Module, you can also set up notifications in your Wink app (or any other smart hub you have set up). The app will tell you if you’ve left the door unlocked and let you lock it remotely. The Yale Assure SL works with the corresponding Yale Secure App, but only if you have the Apple HomeKit module. If you have the Z Wave or Zigbee modules, there is no app that works with the device, which is disappointing. 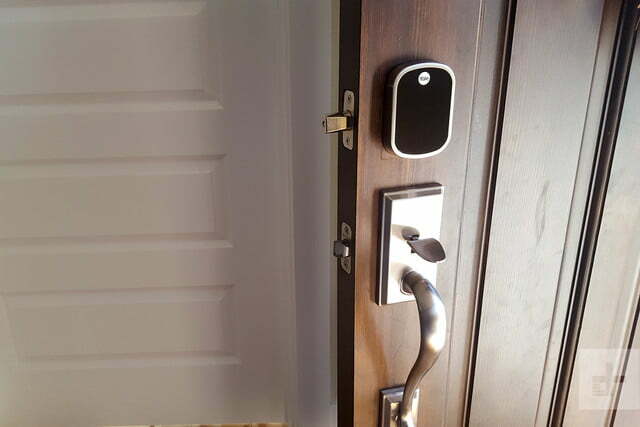 If you have a Z Wave or Zigbee module, though, you’ve automatically updated your lock to be smart (using a bridge) without the need for an app anyway. Still, it would be nice to have an app that works with all platforms in order to do things like set lock codes remotely. Yale has created a beautiful product, but the app needs some work. While Yale has created a beautiful product, the app need some work. We’re hopeful about this, though, in light of the recent news that Yale has purchased August locks, especially since the newest August locks now work with Amazon Alexa. Perhaps the two giants can bring solid software to the table. Despite small gripes about the app, the size of the hardware on the back, and the price, we’re still happy with the slim-lined beauty of this device and think that the front-door design should be the one to emulate. Even after all this time testing it, we’re still admiring how attractive it is. The fact that it also works well makes it a great addition to the front door. Yale offers a lifetime limited warranty for finish and mechanical parts, and a one-year limited warranty for electronics. The Yale Assure Lock SL is beautiful, stylish, and functional. It’s perfect for those seeking a simplified yet elegant-looking lock that, when paired with a Network Module, works seamlessly with your smart home set up. It is, however, a bit expensive at $200 – that’s $250 if you buy the Network Module and the lock together. The Kwikset Obsidian lock ($179) has a similar look and price, but isn’t a fully-functioning smart lock yet. If you don’t need a keypad, the 3rd-generation August Smart Lock, starting at $149, offers a sleek device that also integrates with other smart features in your home. Yale has a great reputation for making great locks, and has just purchased August Locks, which has put out some outstanding smart locks and security devices. That, along with a limited lifetime warranty on this device, means that you’re in pretty good shape. If you’re tired of bulky, ugly door locks and are looking for a sleek, stylish keypad to upgrade the look of your front door, definitely buy this lock.